Amazon (AMZN) shares were up 3.6% on Friday but that simple statistic does not paint a complete technical picture. The position of the close relative to the open, as well as the direction of money flow is much more important. 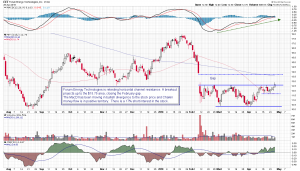 The stock gapped open in Friday’s session but immediately began selling off, closing near its low of the day and forming a large dark candle on the chart. While Amazon was up 3.6% on the session, it had been up as much as 7.9%, meaning that it saw a 4% pullback from that intraday high. Daily volume was over 100% higher than the 50 day moving average of volume. A higher daily stock price on nearly double the average volume is normally a good thing but in this case, it could be just the opposite. First off, the price action represents rejection, an inability to hold higher levels even for a short period of time. Secondly, the volume bar is indicated on the chart as being an up-volume day, but that was not the case. Volume bars simply reflect up or down volume based on the value of the closing price. If the close was higher than the previous day’s close volume is considered positive, and if the close was lower than the previous day’s close the volume is considered negative. The accumulation/distribution line developed by Marc Chaikin calculates money flow based on the daily close relative to its overall range. If the close is in the upper range of the candle it is considered positive, and is its in the lower range it is condidered negative volume. This is a better way of measuring money flow. The implication for Amazon then is that neither price nor money flow justified the Friday pop in the share price. 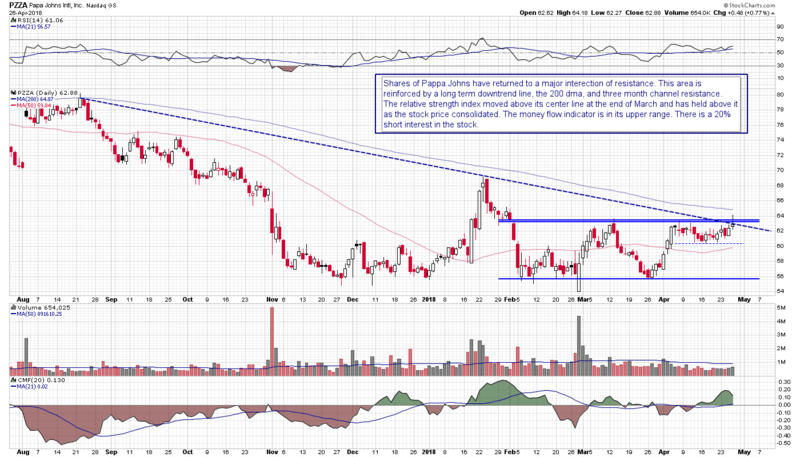 The stock will likely have to undergo so consolidation at lower levels, perhaps fill the upside gap. It is pretty difficult to look at the weekly chart of PayPal Holdings (PYPL) and not believe that the stock is making a major top. There are several technical terms that could be used to describe the price action over the last six months on the weekly chart. 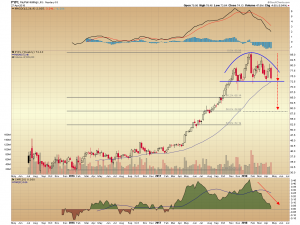 It could be called a head and shoulders top with a complex right shoulder or a rounded top, even a declining triangle. 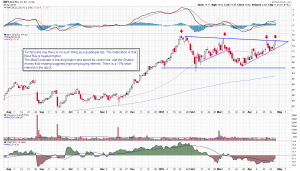 The point is that PayPal is undergoing some sort of transitional process and the integrity of the $72.50 support level, which is now intersecting with the 200 day moving average, is crucial to the intermediate term direction of the stock price. 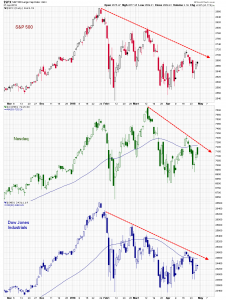 Moving average convergence/divergence and Chaikin money flow have been tracking sharply lower since the top of the pattern formed early this year, reflecting the loss of positive price momentum and buying interest. 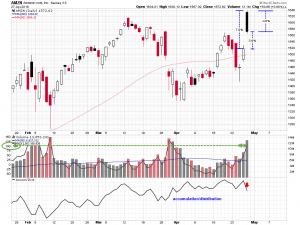 The topping pattern projects a downside price target that is calculated by taking the height of the pattern and subtracting it from the $72.50 support level. 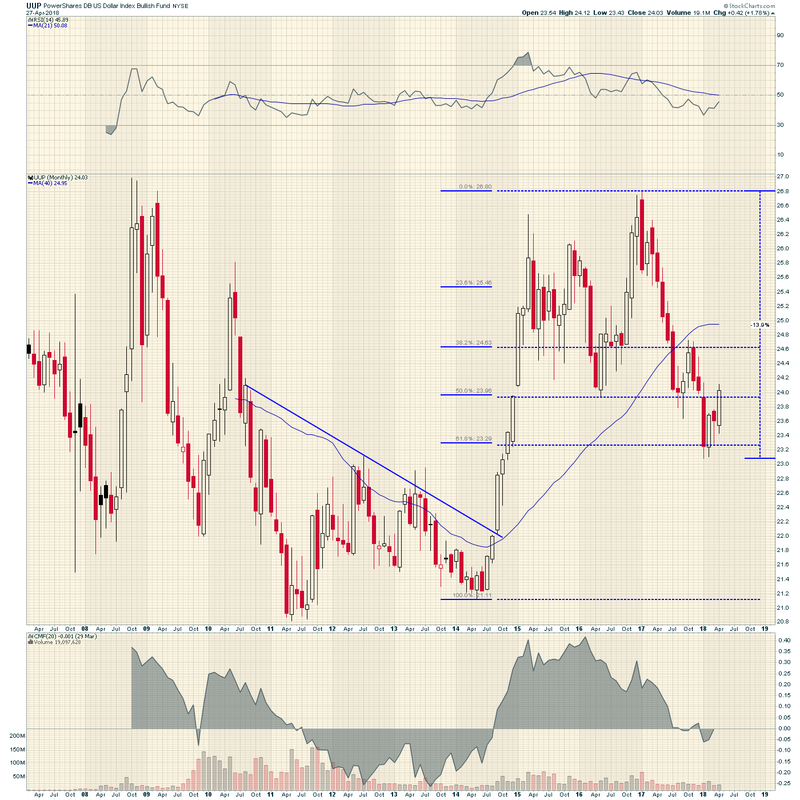 It targets a substantial decline to the $58.75 area or a 50% retracement of the historical range of the stock. That would be a major decline, worthy of a major topping pattern. 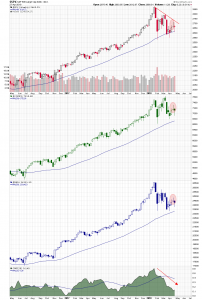 But first support line and the 200 day moving average have to be broken, and that has to be confirmed with follow-up price action. 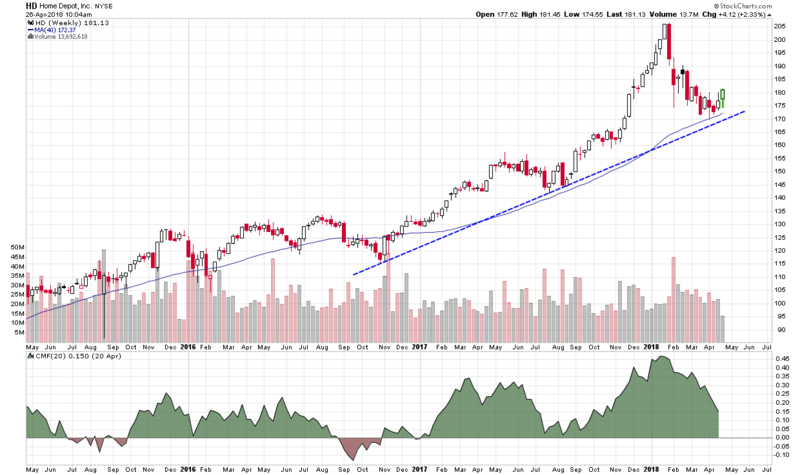 If this reinforced level of support holds then there is, of course, the possibility of a substantial bounce. This may sound inconclusive to the uninitiated technical trader, and it is. The idea behind technical analysis, however, is not to definitively predict the future but to outline possibilities, and be prepared as opportunity presents itself. It was a difficult week for fundamental traders. It seemed like good earnings and the possibility of peace on the Korean peninsula could not drive the markets higher. Good news was bad news and that is bad news. Let’s take a look at the charts of the major market indices for clarification. 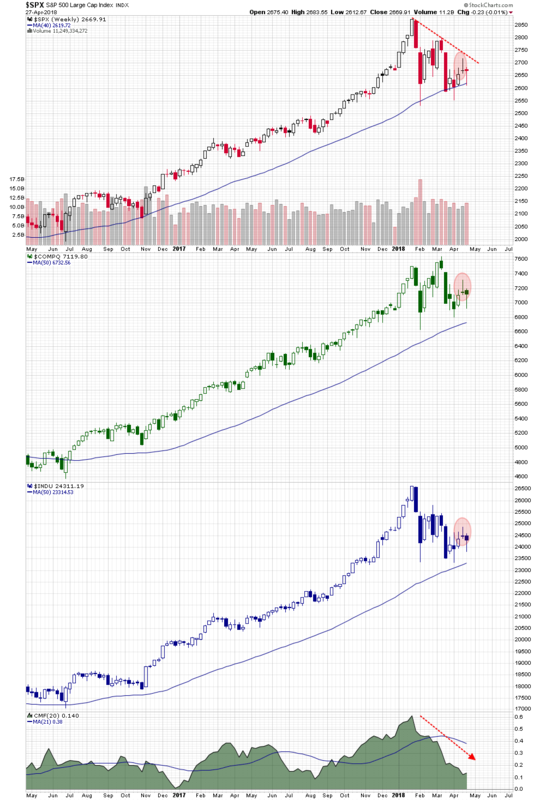 The six month daily charts of the S&P 500 Index, the Dow Jones Industrial Average, and the NASDAQ composite all look similar in construction. They show a series of lower highs made this year, above either flat to slightly higher new lows, reflecting consolidation. Simple enough. A closer look at the S&P chart we have been highlighting recently shows the pattern in more detail. This chart includes Fibonacci retracements measured off the 2018 range, and the 50 and 200 day moving averages. 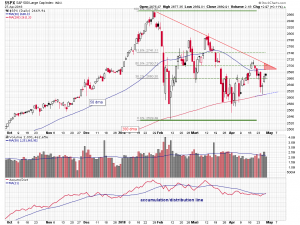 There is a zone of resistance (red triangle) delineated by the 50 day average, the 50% retracement level, and the downtrend line drawn off the highs this year. 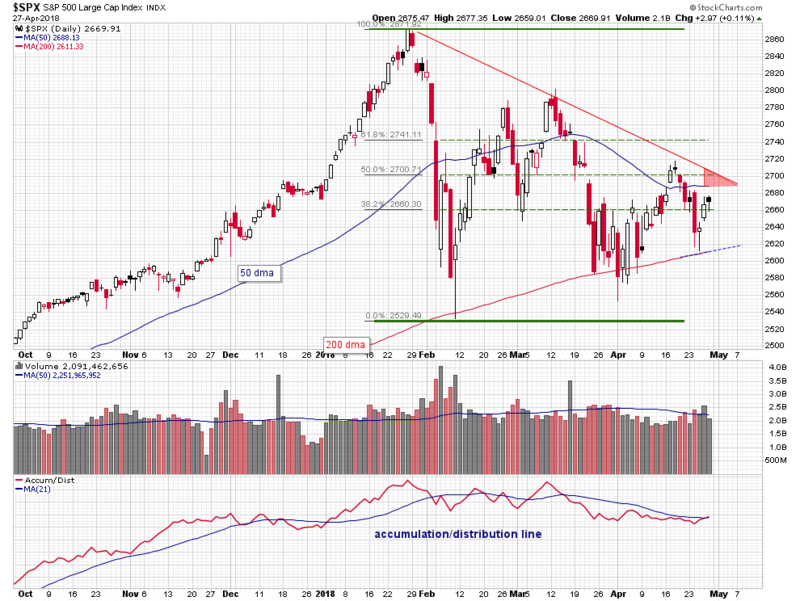 The rising 200 day moving average would be expected to act as support. Gravestone doji candles formed on the weekly index charts last week. We noted them and their potential significance here. Dojis have very narrow opening and closing ranges and the opening and closing range on a gravestone doji is situated at the bottom of its overall candle range. It, also, has a long upper “wick” or shadow and little or no lower “tail” or shadow. The message of the gravestone doji is that the bulls had early control, taking the index up to the high of the session. But at some point the bears wrestled back control and took it down into the close. It reflects a one day or, in this case, a one week transition in trader sentiment. 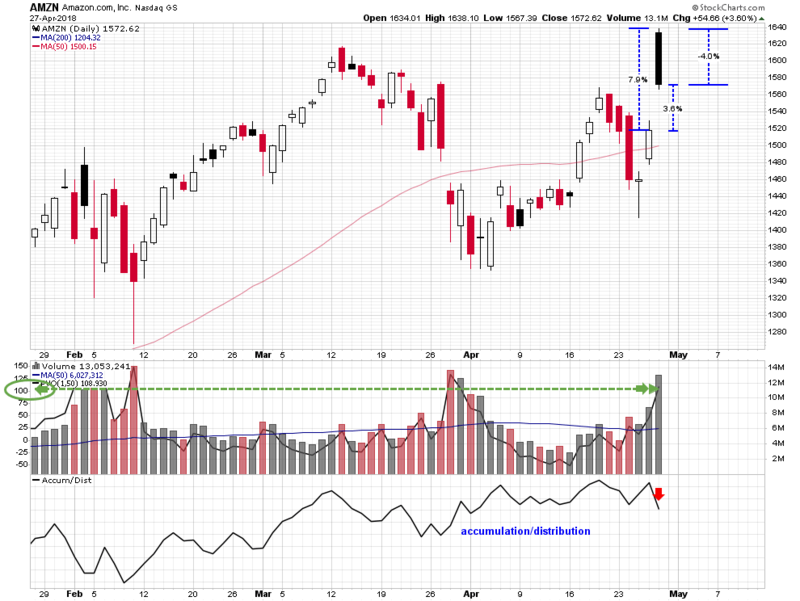 Those dojis were followed this week by what look like classic hammer candles, but could, in fact be hanging man candles. The difference being that a hammer candle is usually seen at important lows, forming in areas of support. It is a bullish reversal indication. A hanging man looks just like a hammer candle but it usually forms at important tops and below technical resistance. It is a bearish reversal indication. How do you tell the difference? You look at the candles within the context of the trend and the overall technical picture, but ultimately only time will tell. The daily S&P chart is the primary pictograph to focus in on next week. 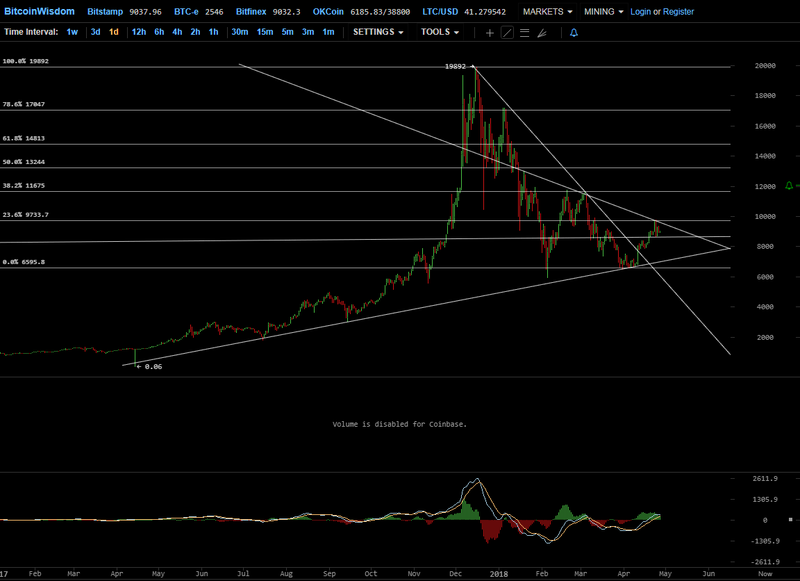 It looks like the converging support and resistance lines are nearing their apex. 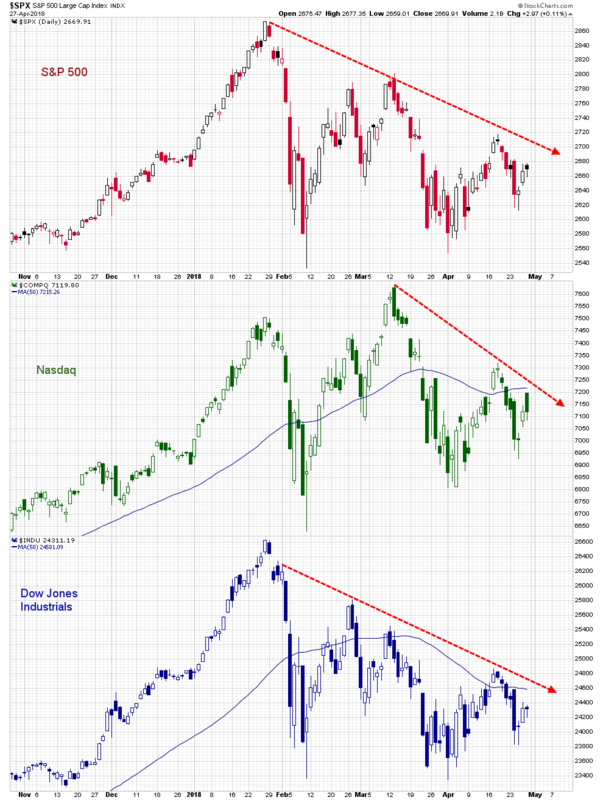 A break out or breakdown is imminent and either one will have intermediate-to-long term effect on the markets. The dollar’s decline off its 2009 high is captured on this monthly chart of the PowerShares DB US Dollar Index Bullish Fund (UUP). As the long term decline accelerated a well-defined downtrend line formed between 20110 and 2014, along the path of the declining 40 week moving average. 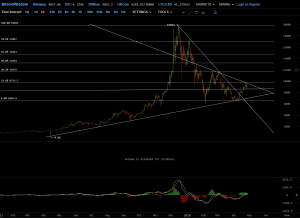 In late 2014 both the average and trend line resistance were broken to the upside. With some pullbacks along the way, in January 2017 the UUP managed to recapture its old 2009 highs. But the upward momentum shifted quickly and dramatically that month. The January high marked a top and the subsequent rapid drop in the value of the dollar took the fund down 14% by January of the next year. Over the last three months, however, the UUP looks like it is in the very early stages of forming a base. The price action of the last four years has defined support and resistance around the Fibonacci retracement levels measured off the 2014 low and the 2017 high. The May 2016 low held at the 50% retracement level, the next four bars closed above the 38% retracement level, and the 2017 decline has been punctuated by fits and starts around all three of the major retracement levels. So far, this month (there are two days to go before the candle is matured) the UUP is holding above the 50% level. Both the relative strength index and Chaikin money flow are below their center lines but turning back up. This reflects improvement in positive price and money flow momentum. The basing action above this key Fibonacci level can be seen in more detail of the UUP daily chart. 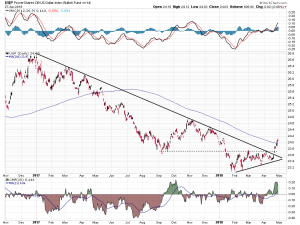 It began making a series of higher lows in February just below the $26.70 level, but unlike similar patterns in the past, this time it broke above the long term downtrend line. 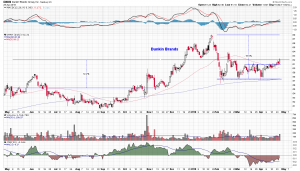 It continued higher last week and pierced its 200 day moving average. Moving average convergence/divergence has made a bullish crossover and is tracking higher and above its center line. While the Chaikin money flow reading suggests renewed buying interest. It’s likely there will be another pullback at some point in the near future, followed by and another period of horizontal consolidation. It takes a while to turn the long term trajectory of the US dollar, but it looks like the start of the process. Checking the charts on bitcoin. Is a boom on the way? With CNBC’s Melissa Lee and the Fast Money traders. These charts show why bitcoin is headed to the moon: Technician from CNBC. The “Chart Master” uses the CBOE Bitcoin Futures data to plot his chart. Here is ours using Coinbase BTC/USD data. 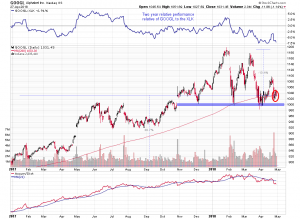 Alphabet Closes Below Its 200 Day Moving Average – Is The $1000 Level Next! Shares of Alphabet (GOOGL) are up over 30% since January 2017, even with this year’s 13% pullback off their January highs. An impressive run but still the stock underperformed the Technology Select Sector SPDR Fund (XLK) by 7% in that time. It is also, the FANG component whose share price is under the most pressure this year. In Friday’s session Alphabet closed under its 200 day moving average. This is not the first time it has closed below this key technical average this year. It was retested over multiple days just last month. But by comparison, in 2017 it never tested the average, in fact, it never touched it or even came close. Actually, last month it was not the 200 day moving average that ultimately supplied support. It was the $1000 level. As most technicians know, large round numbers have psychological properties that often attract or repel price moves. 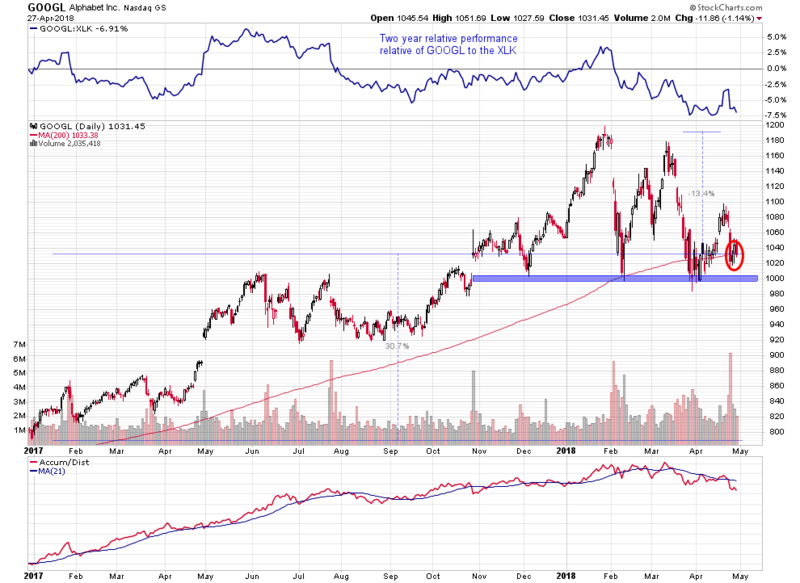 If there is a post earnings sell-off next week and the big technology names that have powered this market for so long, start to fade, Alphabet will retest its $1000 level. Will it hold again or give way to further downside is problematic. The trajectory of the accumulation/distribution line suggests that the stock is under distribution. 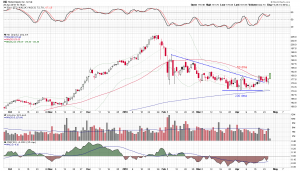 Shares of Best Buy (BBY), Forum Energy Technologies (FET), and Papa Johns (PZZA) have been consolidating in tight patterns recently, and are retesting pattern resistance levels. Price momentum and money flow indications have been improving on both the daily and weekly time frames. 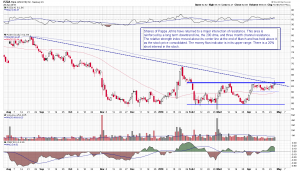 Short interest in these stocks is high and breakouts could initiate short-covering rallies. 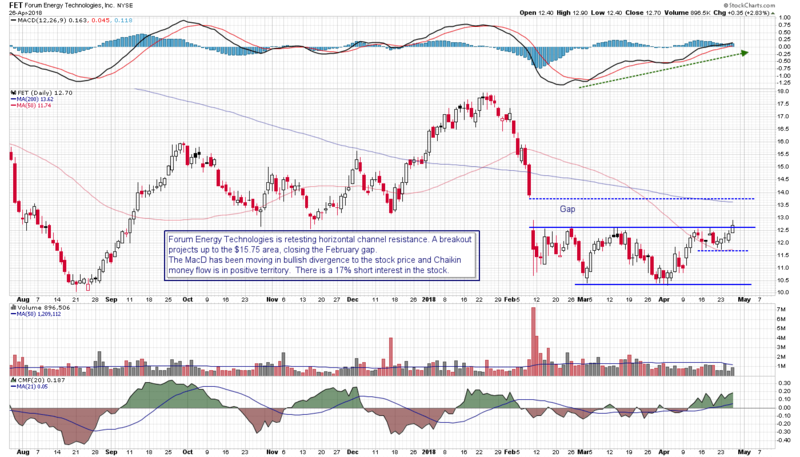 The daily charts below are annotated with support and resistance levels and quick commentary. 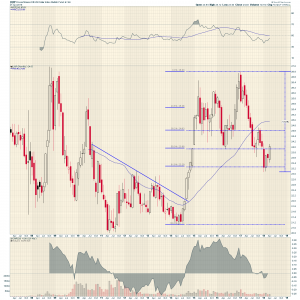 According to Gundlach, the base breakout has “explosive, potential energy,” and “bond king’s” upside pattern price objective targets a $1,000 move in the precious metal. This inverse head and shoulders base has not gone unnoticed by market technicians. On the weekly chart of the Continuous Spot Gold Contract, the left shoulder of the pattern formed between 2013 and 2014, and the “head” low was made at the end of 2015, with the right shoulder developing in 2017. The 40 week moving average (approximate 200 day moving average) is included on the chart. Neckline resistance is located at the 38% Fibonacci retracement level of the 2011 high and the 2105 low. We highlighted a similar long-term consolidation pattern on the SPDR Gold Shares ETF (GLD) as recently as last month here. The pattern’s bullish target price is determined by taking the height of the pattern and then adding that measurement to the breakout point on the neckline. By our calculations this projects to the $1700 area or about a $350 move. Mr. Gundlach may be taking the five year width of the pattern and adding it to the neckline. This projection seems a little on the high side. 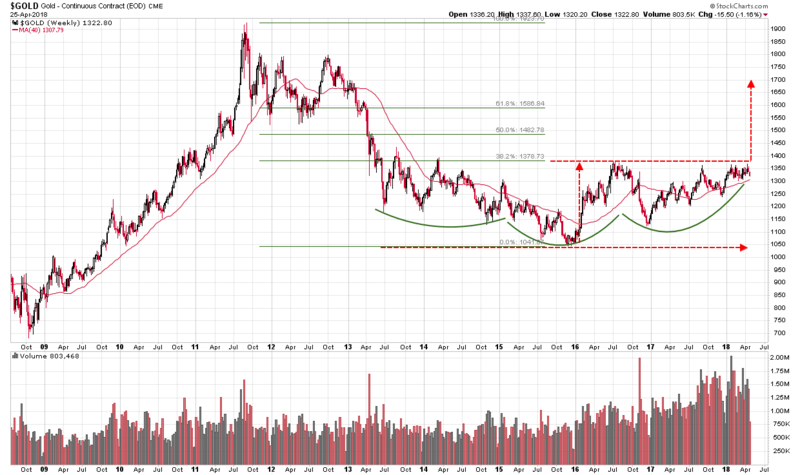 Either way, a break above the head and shoulder neckline will be an important technical event. But like many technical events, it could be triggered by an external market event. That may have greater implications. Historically, gold has been considered a safe haven in times of turmoil. 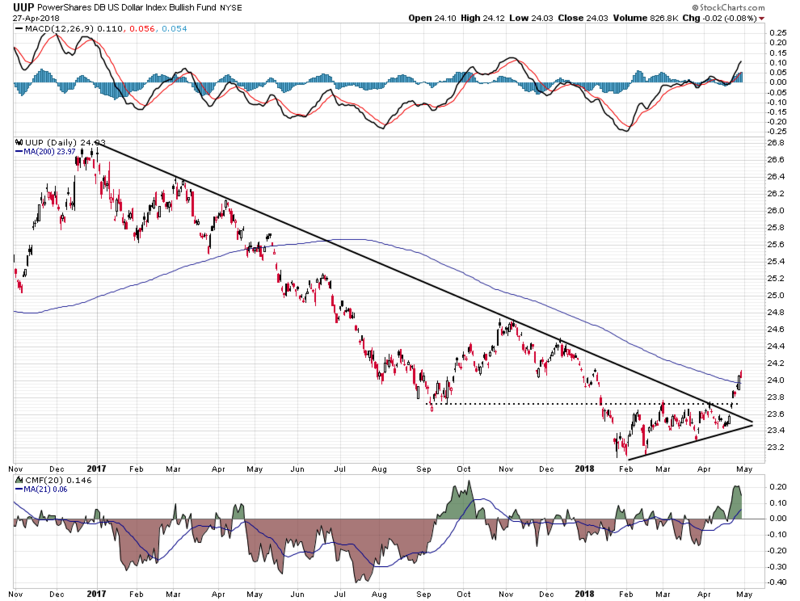 So, while a breakout on the gold chart might be “exciting” and “explosive” in terms of a rally in the price of the precious metal, it may also have a darker side. 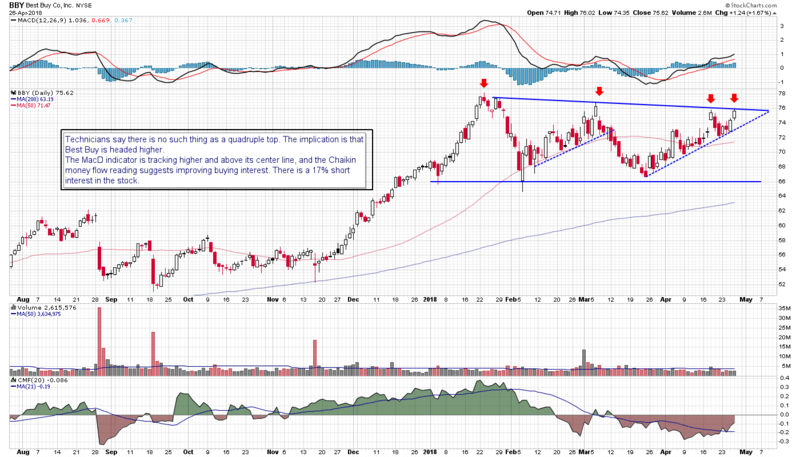 Home Depot (HD) shares are bouncing off weekly long-term support and breaking out of a short-term consolidation on the daily chart. This is a very bullish combination of multiple timeframe indications. We noted this potential upside move earlier in the month here, but we did expect a bit more volatility when it did occur. That has not happened yet, but it still may. To recap: the stock has bounced off an uptrend line this month that has paralleled the rising 40 week moving average, since late 2016. Chaikin money flow on this weekly time frame is in positive territory. 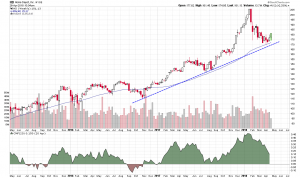 While Home Depot did pull back off its January high, creating a two month downtrend line on the daily chart, it found support just above its 200 day moving average. Then it began moving sideways. 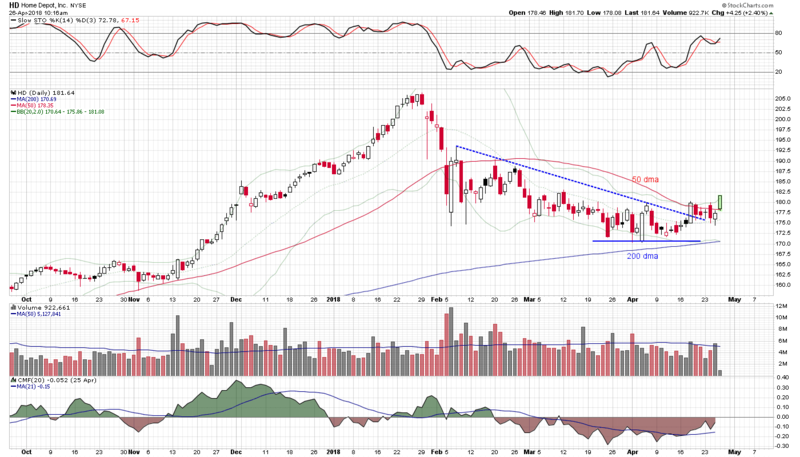 This horizontal price action has penetrated the daily downtrend line and managed to move above the 50 day moving average. Today shares are up 2.4% at this point in the session and making a new breakout high. Momentum is obviously improving and the Chaikin money flow indictor is tracking higher. Home Depot looks like a good risk-reward long candidate at its current level. Jim Chanos on why he’s short Dunkin’ Brands from CNBC. On that news, Dunkin’ shares saw an initial 5% drop in pre-market trading, then managed to move back into the green, and as this is being written, are back down again by about 2%. So they are experiencing volatility and that should continue in the regular session. 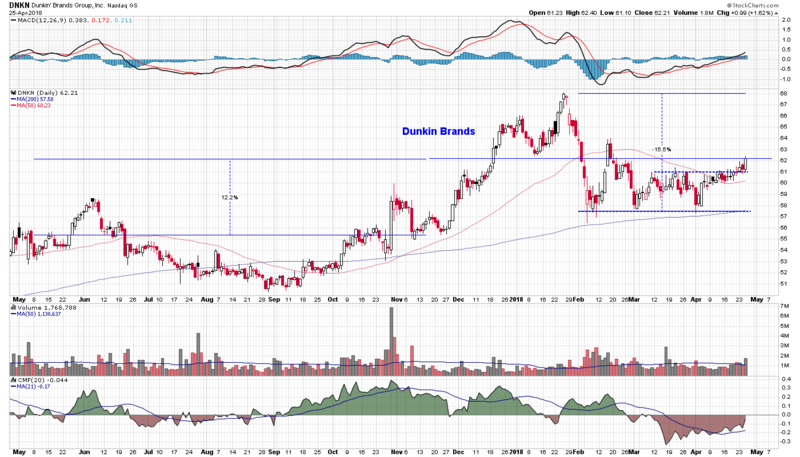 If Chanos took a short position in Dunkin’ this time last year he is down about 13% on the trade. That’s even with the over 15% drop in the stock price off its January high this year. And today might be a good day to make your bear case on the stock because it is poised to break out of nearly three month horizontal channel. A successful breakout could power higher prices and another retest of those January highs. The moving average convergence/divergence indicator is tracking higher and above its centerline, reflecting improving price momentum. While the Chaikin money flow indicator, while still in negative territory, is back above its signal average and moving higher. This reading suggests an increase in buying interest.